It turns the skin, eyes, and other mucous membranes a yellowish tint. This look is never in style and must be remedied immediately. You can change your baby from “Freak” to “Fabulous” with a lavender-colored foundation primer. 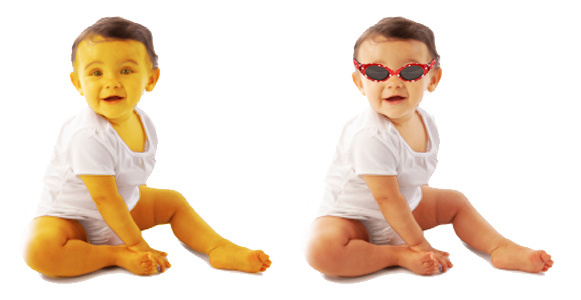 Simply smear over your baby’s exposed skin to counteract the yellow tone. As we learned in elementary school, a primary color (yellow) plus a secondary color (purple) equals brown. When it comes to skin tones, the jaundiced yellow plus lavender equals a nice bronzed baby. To conceal the yellowing whites of her eyes, make sure you select some adorable dark sunglasses to cover them up. You’ll turn her from Baby Banana to Mysterious Diva in a heartbeat. This entry was posted in Uncategorized and tagged coverup, jaundice, skin tone. Bookmark the permalink.